Halo with Side Baguette and Round Diamond Engagement Ring with Pave Setting | Shane Co. This compelling halo engagement ring features 38 round, pavé-set diamonds, at approximately .49 carat TW, and two baguette diamonds, at approximately .20 carat TW. These dazzling gems have been crafted in a quality 14 karat white gold split shank setting; the total gem weight is approximately .69 carat. 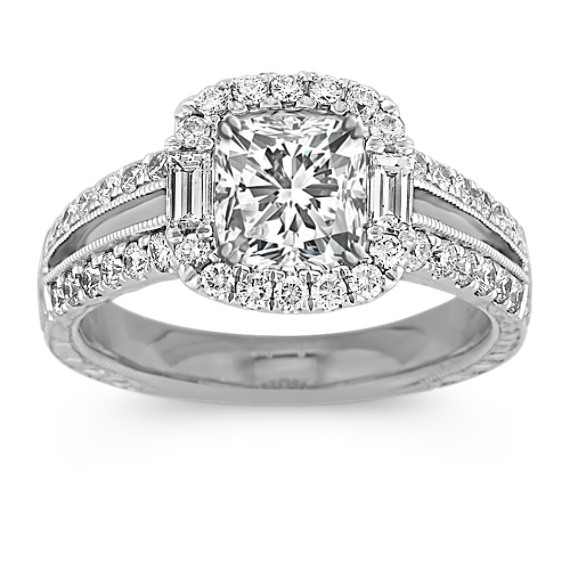 Simply add the center stone of your choice at approximately 1.00 carat.